All South African-based medical emergency air services met with the national health department's Communicable Diseases Directorate in Gauteng on 15 September to 'tighten up communications' after the unprecedented fatal arenavirus outbreak. The virus claimed the lives of four people, one a Lusaka-based safari company staffer, one a Johannesburg paramedic who accompanied her on the mercy flight to the Morningside Medi-Clinic in Sandton, one a hospital nurse and the other a hospital contract cleaner. At the time of going to press a fifth person, also a hospital nurse, was 'serious but improving daily' at the Sandton Medi-Clinic. According to the Chief Director for Communicable Diseases, Dr Frew Benson, the local air emergency services huddle was to be followed up 'very soon' by another with their SADC air emergency counterparts, 'to identify gaps'. Speaking exclusively to Izindaba, Dr Benson said the two main weaknesses identified at the first meeting were the need for prior consultation by air evacuation services with South African Port Control officers (employed by the department of health) and timely consultation by Port Control officials with their own expert medical back-up teams. He said this latter consultation ought to happen 'if any doubt whatsoever' existed about a patient. The deadly viral haemorrhagic virus spread was nosocomial, pointing to a need for increased barrier nursing and infection control procedures. Medi-Clinic said gloves, masks and protective clothing were used as a standard precaution, 'but whatever the virus was it obviously transcended what we had in place'. Benson said extreme caution was needed to prevent any contact whatsoever with body fluids. 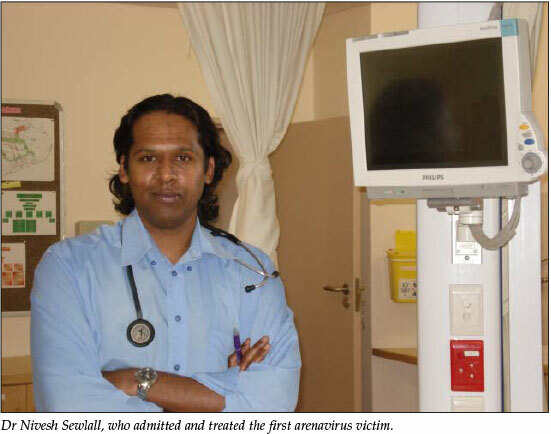 Dr Nivesh Sewlall, who admitted and treated the first victim, Cecilia van Deventer, said she was put directly into isolation as a standard precaution with full infection control protocols followed. Brain-dead upon arrival (12 September) she died 2 days later, having suffered extensive cerebral oedema. The doctor who accompanied her on the mercy flight had told him she was severely hypoxic and feverish and suffered a fit on being entubated without drugs shortly before being transferred from a Lusaka hospital, one of four she visited in Zambia over the previous 5 days. Sewlall said Van Deventer arrived at the Morningside Medi-Clinic entubated, heavily sedated and unresponsive with a fine macular rash on her trunk and upper arms - and with a 'classic tickbite' on her right foot. 'It looked like end-stage multiple organ failure from tick bite fever,' he said. She had arrived without any accompanying notes or blood results. 'We had no clue who had looked after her or what had been done - we were basically flying in the dark,' he said, adding that there was no bleeding and that her renal function was 'pristinely normal'. The casevac doctor told him she had been at a wedding in South Africa 10 days previously where several guests suffered food poisoning for which she was treated upon her return to Zambia. 'Basically in the week before her death (back in Lusaka) she'd had virtually every antibiotic they had in that country,' Sewlall said. Melinda Pelser, spokesperson for the Morningside Medi-Clinic, said a team of internationally recognised medical experts inspected all relevant facilities and questioned staff at the hospital after the outbreak, endorsing their claim that infection control protocols were strictly followed. 'Cecilia van Deventer was considered as having an infectious disease even though all the tests for viral haemorrhagic fever came back negative. It's a new strain - only when the second victim, Hannes Els (Van Deventer's paramedic on the flight), was admitted displaying the same symptoms and pattern, was the link made,' she said. A total of 94 people on the Morningside Medi-Clinic 'victim contact list' were telephonically monitored, all but one of whom emerged safely from the virus window period, with six cautionary admissions due to temperature fluctuations. Sewlall said it remained a mystery how the hospital staff became infected. 'There were no needle sticks, splashes into mucosa.. and nobody could remember any splashes when turning, washing or bathing - I guess they may have worn an apron instead of a gown at some stage but it's virtually impossible to say now'. Sewlall dismissed an anecdotal claim by Benson that Van Deventer suffered a 'deep cut' to her foot around 2 September, saying he had checked her soles and feet and saw no cuts, lacerations or sutures. 'I'm sure I would have seen something like that,' he added. He stressed that before hearing about the second infection, he extensively reviewed the existing data on Van Deventer with a nationally recognised infectious diseases professor at Wits University, without an accurate diagnosis being pinpointed. The moment a haemorrhagic fever diagnosis was made, he had contacted the Zambian health authorities to enable the monitoring of those who came into contact with Van Deventer there. No secondary cases were reported in Zambia. Pelser said none of the wedding guests were followed up as the infectious window period of 3 - 21 days had passed by the time Els died on 2 October. Port Health spokesman, Phil Nzimande, said the Speciality Emergency Services (SES) flight that brought Van Deventer (accompanied by Els), from Lusaka was 'checked'. Symptoms checked for 'would have' included fever, severe headache, high temperature, abnormal sweating, shortness of breath, excessive coughing, severe vomiting, diarrhoea and bleeding. However, because of the similarity of these symptoms to more common diseases like malaria, flu and tick bite fever, the potential for a communicable disease was 'overlooked' (by Port Health staff). SES Managing Director, Marianthy Noble, said paramedic Els was totally asymptomatic when he left Lusaka. 'There was no indication that it was anything like that (a viral haemorrhagic fever). Hannes was sitting in my office the day before and was absolutely normal.' When he eventually got sick, it had presented as flu. The third patient, Gladys Mthembu, a nurse at Morningside Medi-Clinic who tended to Van Deventer, was on leave when she became ill with flu-like symptoms and was admitted at the Sir Albert Robinson hospital in the West-Rand on 1 October. Her condition deteriorated rapidly and she died 4 days later. Similar to all the above cases, initial tests at local laboratories for viral haemorrhagic fever and other formidable infectious diseases were negative. The fourth belatedly confirmed victim was Morningside Medi-Clinic contract cleaner Maria Mokubung, who died on 6 October at the Charlotte Maxeke Johannesburg Academic Hospital where she was being treated for a chronic illness. The fifth person diagnosed with the virus is a nursing sister who tended to Els and was 'conscious and responding better daily' to antiviral treatment at the time of the SAMJ deadline. A sixth person, a radiographer who had taken X-rays of van Deventer, was briefly admitted to St Augustine's Hospital in Durban as a cautionary measure (while on holiday there) but whatever mild symptoms she reported proved to be a false alarm. Benson said a thorough analysis of the entire saga would be made, 'but (on Thursday 16 October) we're still in the middle of the outbreak and that's our priority right now. We haven't analysed all the areas where there are weaknesses, but we're tightening up immediately where it's obvious'. He said his department had identified more than 130 contacts (by 16 October) and they were (then), 'growing by the day' (51 contacts were identified by Monday 13 October). Of concern was a recent analysis of infection control in public hospitals nationally which showed 'serious gaps' - and it had now emerged that the private sector was vulnerable. Morningside Medi-Clinic's audits did throw up one disturbing practice. Alarmed administration staff were unable to find certification that the hospital's infection waste collection company was destroying the material it was being paid to remove. The company, Psychem Waste Solutions, was found to be stockpiling the material in unventilated and non-refrigerated trucks at their offices in Selby, south of Johannesburg. Infectious medical waste may only be stored for 72 hours and anatomical waste for 24 hours, unless frozen. Psychem's loaded trucks stood parked for several days, its MD, a Mr Ludwig Hartmann, citing the reason as a competitor 'out to discredit them' by spreading rumours among waste destruction sub-contractors that they (Psychem) had a bad credit record. This led to them being 'forced' to store the waste when their own subcontractor, EnviroServ, suspended its contract for a week, right at the time of the outbreak. Psychem has contracts with more than 80 hospitals across the country. Pelser said Morningside Medi-Clinic had terminated their contract with Psychem when they were not meeting the service level agreement and immediately notified the authorities. In terms of international 'cradle to grave' waste management requirements, waste generators are responsible for ensuring that their waste is destroyed. The 'Green Scorpions' in Gauteng have launched an investigation. Asked what punitive measures were available to ensure that emergency air evacuation companies in neighbouring countries complied with infectious disease management protocols, Benson said that as far as he knew, 'we cannot fine an organisation for not complying with international health regulations'. All bloods involved in the outbreak were sent to the Centres for Disease Control (CDC) in Atlanta, where the virus was provisionally identified (in partnership with the local National Institute for Communicable Diseases) as an arenavirus. Arenaviruses are a family of viral haemorrhagic fevers related to Lassa fever. They cause chronic infections in multimammal mice - a kind of wild mouse that excretes the virus in its urine and stools which can contaminate human food or house dust. Viruses similar to the Lassa fever virus have been found in rodents in Africa, but other than in West Africa, had not been found to cause diseases in humans. Further tests are needed to find out whether this current strain is an undiscovered member of the arenavirus and what its distribution is.